Power. Torque. 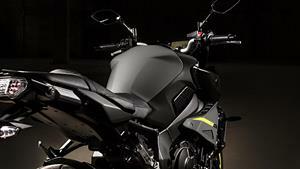 agility The MT-10 is the one you’ve been waiting for. It’s by far the most powerful Hyper Naked ever created. And the time has come for you to enter the next level of darkness. The 998cc liquid-cooled in-line YZF-R1-derived 4-cylinder engine features intake, exhaust and fuelling systems that contribute towards its strong low to mid range performance. With an uneven 270° - 180° - 90° - 180° firing sequence, this exhilarating crossplane engine delivers linear torque with instant response and precise control. 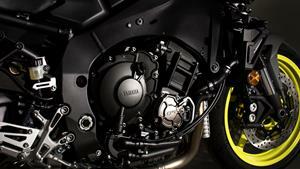 For the highest degree of rider control, the MT-10 is equipped with a Yamaha Chip Controlled Throttle (YCC-T) as well as an easily adjustable Cruise Control system that operates above 50km/h. To suit different conditions the Yamaha D-MODE system offers three engine running modes - and a 12V DC outlet can accommodate various accessories. The MT-10's switchable Traction Control System (TCS) features three intervention levels to ensure smooth roadholding in varying conditions. The Quick Shifter System (QSS) enables full throttle clutchless upshifts - and a compact Assist and Slipper (A&S) clutch gives you precise control during acceleration and deceleration. The handlebar/seat/footrest relationship gives a slightly forward leaning riding position that enables you to make full use of the linear torque. And to emphasis its dynamic 'mass forward' looks, the MT flagship features compact side cowls with duct shaped covers as well as a shouldered fuel tank cover. The MT-10's compact and lightweight chassis is developed from the award winning YZF-R1 design. For outstanding agility together with light and neutral handling this class leader features fine-tuned geometry settings and an ultra-short wheelbase of just 1400mm - making it one of the most compact in the 1,000cc class. The top of the range MT is equipped with a lightweight aluminium Deltabox main frame and extra-long upward truss type aluminium swingarm that features an optimized strength/rigidity balance. 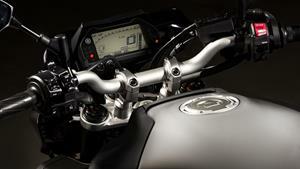 This YZF-R1 developed design delivers class-leading handling with good straight line stability and lightweight agility. Based on the YZF-R1 suspension, the fully adjustable 43mm cartridge-type front forks and link-type Monocross rear suspension systems are some of the most advanced designs in the naked one-litre category. Featuring model-specific settings, this race-bred suspension gives excellent handling precision and riding comfort. 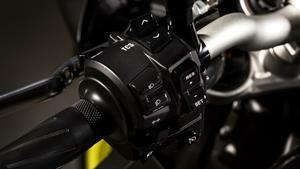 The MT-10 is designed to excel in every category, including braking performance. Dual 320mm floating front discs are equipped with radial 4-pot opposed piston calipers that generate immense stopping power with precise fingertip control - while a 220mm rear disc provides plenty of feel. ABS is featured as standard.